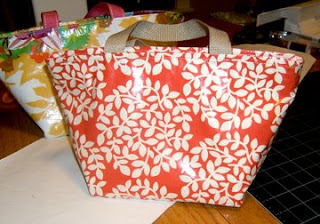 This one's a little smaller and less angular than my last bag, and I think I like it better. Still lightly insulated with wipeable vinyl interior and exterior. So I finally got this bag finished up, and I was ironing it smooth again with a paper layer over the vinyl to prevent melting to my iron, when I slipped up and let the iron make direct contact with the handle. So sad. So the handle has a melty spot on it now! 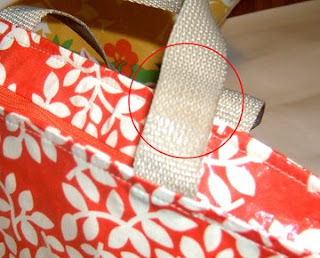 It's barely noticeable, but it means This bag will have to be discounted, dern it. So if anyone wants it, let me know. I'm thinking $5.